On December 13, Liu helped Chen Jianfang file an Administrative Complaint and a Request for Administrative Compensation against the Baiyun airport police and the Baiyun border inspection officials for preventing Chen from going to Geneva on September 14, 2013 to attend a human rights training and observe the Human Rights Council in session. In this statement, Liu says that the Baiyun District Court had not officially accepted the complaints, and even told him that "leaders' approval is needed." Liu disagrees with the court’s characterization that the Baiyun border inspection officials were enforcing "national security" laws. He argues that the court has jurisdiction because the officials were enforcing the "Exit and Entry Administration Law”—an administrative duty—and therefore are subjected to administrative lawsuits in accordance with the law. Liu warns that this case affects not only Chen Jianfang but also all other citizens' right to travel abroad. The Administrative Complaint and Request for Administrative Compensation filed by Chen with the help of Liu is posted following his essay. 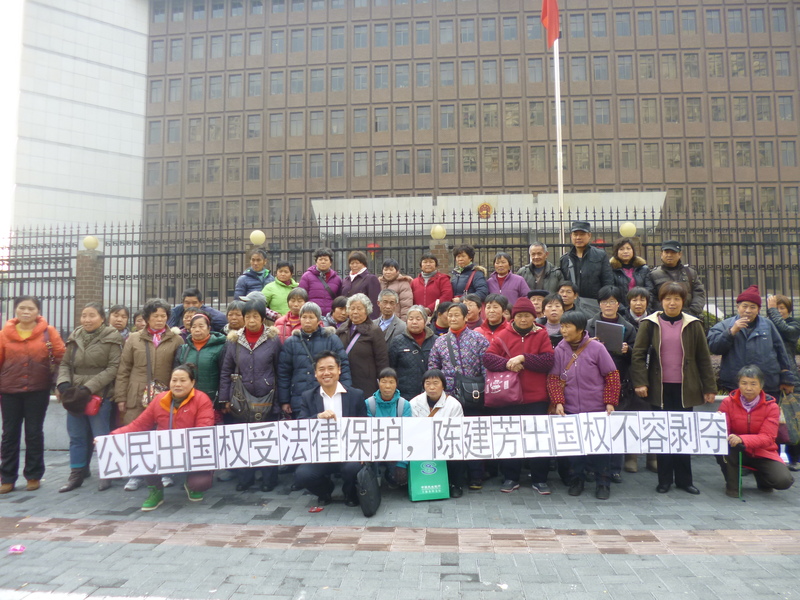 On January 3, Chen Jianfang’s supporters went to the Shanghai No. 1 Intermediate Court and unfurled a banner that reads "Citzens' Rights to Leave the Country Are Protected by Law, Chen Jianfang's Right to Leave the Country Must Not be Deprived."